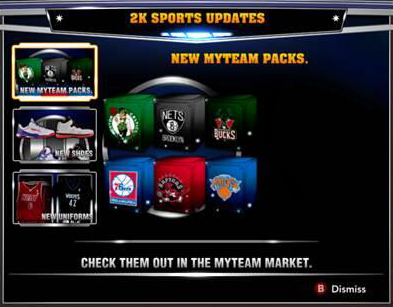 Introducing NBA 2K14 MyTEAM team packs on PlayStation 3 and Xbox 360. Get a random player from your favorite team with packs. Series one includes Philadelphia 76ers, Toronto Raptors, New York Knicks, Boston Celtics, Brooklyn Nets, and Milwaukee Bucks. Keep an eye out for Series 2 coming soon!